Build your own zoo and manage it to success - Bring in animals, take care of them, manage the zoo and attract visitors to build a successful zoo. * Wide variety of 100 realistic 3D animals to collect and discover - As players progress in the game, they unlock more and more animals to bring to their zoo, from penguins, lions and elephants to even extinct animals. * Watch your animals perform awe-inspiring talents and movements and capture them to entertain visitors - Once the player has built strong relationships with their animals * Create a personalized photo album - Capture your favorite animals and their best talents to keep in your photo album and share with friends via SD card. 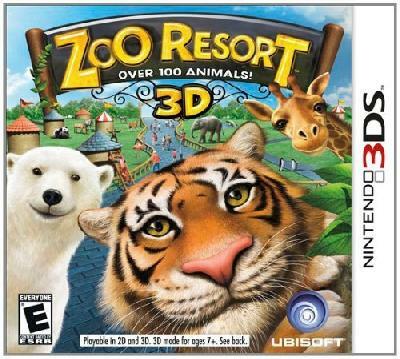 * Fully leverages Nintendo 3DS technology - Zoo Resort is a great game for any Nintendo 3DS owner who wants to fully utilize the new technologies of the Nintendo 3DS, featuring 3D animals, camera and motion-sensing movement and incredibly realistic graphics. This is a very good game. I got it because I am an animal lover and when I saw that on the title it has "over 100 animals" I was curious. This game does have a lot of animals that surprise you when you get them. The graphics are pretty awesome and it is a game that will keep you busy for hours on end. Great for kids and adults a like. As a long-time fan of Zoo Tycoon and its sequel, I was intrigued by the idea of a new 'build your own zoo' game. However, this is not really such a game, box-blurb notwithstanding. In Zoo Tycoon, you have a piece of land, lay out paths and fences, place stores and animal houses, buy animals and decorate their exhibits - you build a zoo. In Zoo Resort, you . . . are a PR person, really.You begin this game with a piece of a zoo (you can buy further segments at ever increasing prices) that contains one Asia..
S. J. Chapman - See all..